The weather continued to be kind when Somerset came to Welford BC to play their annual friendly and despite lending a couple of players to the visitors, Warwickshire still took the honours 121-108. 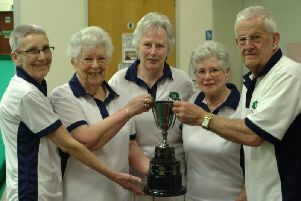 Highest winning rink went to Sue Hornsby with Di Thurlbeck (both Lillington), June Austin (Three Spires) and Liz Westell (Welford) who were never in doubt as they stormed to a 24-13 win capping it all with 6 shots on the 21st end. Chris Cooke (Southam) with Janet Greenwell (Wolvey), Linda Linney (Stratford) and Carole Simmons (Welford) started well but were further encouraged with 6 shots on the 5th end and they successfully retained their lead to finish 22-15. Jean Petty (Norgren) with Joy Cooke (Blossomfield), Denise Judge (Bilton) and Janice White (RLS) also started well but were held on 6 shots for 5 ends whilst the visitors took advantage but 5 shots on the 11th end helped their cause and they didn’t look back finishing 25-18. Helen Harris with Chris Roberts (both Stoke), Carole Cox (Snitterfield) and Chris Harrison (Ambleside) were fairly evenly matched all through the game but just managed to pip their opponents to the post and win 17-15. Maureen Tims (Whitnash) with Antoinette Lambert (Ambleside), Margaret Colvin (Snitterfield) and Vanessa Brazier (Rugby Railway) weren’t so fortunate and struggled to gain any shots until the last third of the game when they pulled back to level 19 all at 19 ends, but were unable to hold it and eventually finished 19-26. Maureen Edwards (Rugby Thornfield) with Janet Pooler (Stoke), Ann Doherty (Lillington) and Jean Williams (Stratford) were under the hammer from the start and despite 4 shots on the 10th end which pulled them back to an 8-10 deficit and a strong surge towards the end it wasn’t enough and left them 14-21 adrift at the end. County President, Joy Cooke (Blossomfield) was delighted to present a Colt Badge to Denise Judge.